This WRRA record certifies that on 5/15/2009, Aurélien Bonneteau set a new Adult Male World Recumbent Racing Association record in the Non Faired class by riding 31.397 miles in 1:00 (hours:minutes:seconds.subseconds) at an average speed of 31.397 MPH (50.529 KPH). This record was accomplished while riding a M5 Lowracer recumbent bicycle during the 31.397 miles event at the Velodrome du Lac, Bordeaux, France. 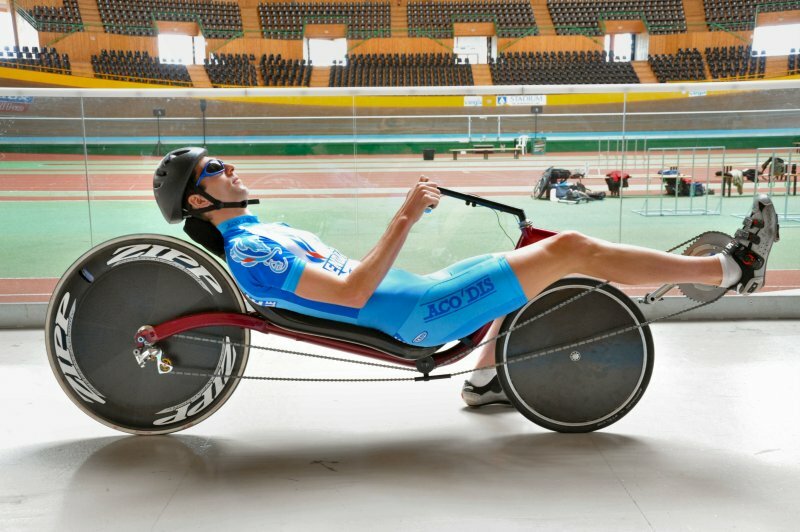 On May 15th, 2009, 26 year old Aurélien Bonneteau broke the one hour unfaired world record in Bordeaux-Lax, France at the Guy Lapebie indoor velodrome by pedaling 50.529 kilometers (31.32 miles) in one hour. Aurélien was racing an M5 lowracer set up with single speed gearing, both front and rear wheel disks, and a very elliptical chainring.